The author is Project Associate Professor, Graduate School of Agricultural and Life Sciences, the University of Tokyo, Japan. Like it or not, we are all crewmembers on the same ship, sailing the seas and fishing. A small hole has opened in the bottom of the ship, but we are too busy fishing and can’t bother ourselves with the matter of a small hole. However, if we don’t take action, the hole will definitely get bigger. The problem will accelerate, a large amount of seawater will pour in, and the ship will sink while we stand helplessly by. Everyone knows what the top priority should be, but our leaders are dazzled by the schools of fish before their eyes and don’t even recognize that a hole has been opened, or they underestimate the problem and try to defer action. We human beings (Homo sapiens) only recently appeared on the earth as a species with a highly developed cerebrum, sharply distinguished from other animals (or, at least, so it is believed). Indeed, the cerebrum has created complex societies, a continuous stream of discoveries, inventions, and developments, and is now trying to produce artificial intelligence. Within that history, the benefits of discovering and developing petroleum have been inestimable, and resulted in dramatic changes to our daily lives. In the beginning, petroleum was a dormant substance never taken up into ecosystems. We humans turned our eyes to this substance and, starting about 120–140 years ago, we began full-scale use and have continually burnt petroleum since then. Today, however, the traffic light is signaling “yellow” for the continued existence of the species Homo sapiens due to continual massive burning of fossil fuels such as petroleum. These events, occurring in the real world, are like watching a live-action version of Pandora’s box from Greek mythology. What has escaped from Pandora’s box is not just carbon dioxide. We have created and released many things –environmental hormones derived from chemical substances, ozone gas, nuclear waste, and the microplastics which are a recent focus of concern – and yet none of these have been collected. Can the cerebrums of Homo sapiens overcome these difficult problems, as we have always done before? Unfortunately, my prediction is pessimistic. One reason is that the speed of increase in carbon dioxide concentration is too fast. In the past, the carbon dioxide concentration on the earth has repeatedly risen and fallen in the range of 170–300 ppm with a cycle of about 100,000 years, but the level surpassed 315 ppm in 1958 and only 57 years later, in 2015, exceeded 400 ppm. During this period, researchers spent time developing an understanding of the current situation and the cause-effect relationship between the rise in carbon dioxide concentration and climate change. Recently, it seems we've finally reached the point where we can point out the tragic future facing polar bears, coral reefs, and the small islands that will be submerged under rising oceans. Under these conditions, there are many good reasons for our lack of a sense of crisis until now. It is not my intention to stoke a crisis mindset, but there is a considerable gap between the actual risk and our sense of crisis. The future impacts of climate change will not only be direct disasters; the flames are likely to rise from all different directions. For example, consider the problem of pandemics. Living organisms have adaptively evolved by varying their DNA in response to environmental changes. Organisms like bacteria can adapt by changing their DNA quickly in response to the ultra-high-speed environmental changes currently underway. In cases like livestock and human beings, however, it takes a few years to a few tens of years to modify DNA (i.e., it takes time to give birth to offspring). Livestock and human beings – weakened by their inability to keep up with rapid climate change – will become susceptible to attacks by more vigorous viruses and bacteria. As a result, it's just a matter of time until pandemics move from the movie screen to the real world. Going forward, researchers will repeatedly carry out large-scale studies and experiments from multiple perspectives to determine what will happen when the carbon dioxide concentration in the atmosphere exceeds 1000 ppm, and they will publish after consolidating their results and reaching a consensus. However, by that time, the carbon dioxide concentrations assumed in their experiments will be real. In this way, the problem-solving speed of the human cerebrum cannot keep up with the excessively high rate of increase in carbon dioxide concentration. It has previously been thought that there is no real need to worry about direct impacts on the human body in the case of a carbon dioxide concentration of 1000–3000 ppm, which all people have experienced in daily life in enclosed spaces. However, according to a number of highly reliable recent experimental studies, if a person is exposed for a long time even to a concentration of 1000–3000 ppm, there is a marked decline in high-level abilities such as formulating strategies. If conditions continue as is (and the probability of that is quite high), the carbon dioxide concentration in the atmosphere will likely exceed 1000 ppm only 80 years from now. If that happens, humankind will recede further and further from solutions and, in the end, will go down in the history of terrestrial organisms as a species that went extinct due to an "own goal". It's an ironic turn of events, but it's not absurd to see this as a kind of law of nature. There are other reasons for my pessimistic prediction. Although it's a huge problem, our vaunted cerebrum devised solutions long ago. For now, it's enough to just put a rubber stopper in the bottom of the boat. In other words, it’s enough to stop using fossil fuel in the near term. Our main purpose in burning fossil fuel is to obtain electrical and thermal energy. Electricity is a type of secondary energy, and can be produced from renewable energy suited to each region, and usage as thermal energy can be switched to carbon-neutral green energy. At the same time, a considerable reduction in carbon dioxide emissions can be achieved simply by raising heat usage efficiency through consistent utilization of existing heat pump technology and similar approaches. It’s simple. But we can’t do it. We can do it, but we don’t do it. The choice of not doing anything is also a product of the human cerebrum. We cannot face the inconvenient truth. We are subject to immoderate desire and greed – caught up in the allure of immediate profit. It's a crazy story where we grab gold bars, but won't let them go off even as they drag us into the deep sea; but this too is the unvarnished reality of our cerebrum, and lays bare its limits. I'm in no way being critical; I simply believe we should be aware of these limits. There's an optimistic ending to the story of Pandora's box. After all of the evils and troubles were released, a card with the word "hope" remained at the bottom of the box. There should still be a path leading to hope. 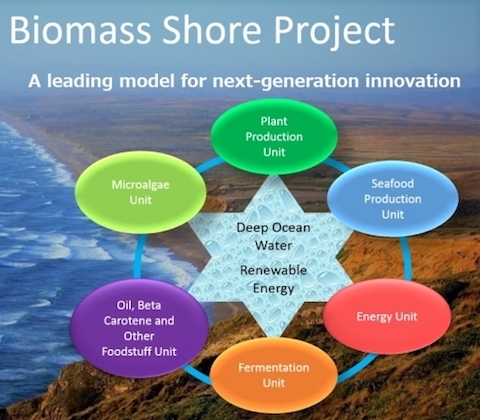 To help with that, I would like here to introduce the Biomass Shore Project (BSP) that I am proposing. As explained earlier, the main purpose of burning fossil fuels is to obtain energy. Frankly put, fossil fuels with high energy density are like refined sugar and we are addicted. What we must do is switch from a society with unlimited usage of fossil fuels (high energy density) to a society which efficiently uses renewable energy (low energy density). The purpose of this project is to formulate a model of a society which can carry out industrial activities while reducing carbon dioxide. This will be achieved by establishing a biomass industrial complex to replace the petroleum industrial complex, and will be done in coastal desert regions that have not previously been utilized. This industrial complex will be composed of the following units: a temperature difference desalination system employing solar heat, a large-scale microalgae biomass production system using halophilic microalgae, plant-derived chemical industry taking microalgae products as a starting point, fermentation industry, smart agriculture industry, and smart aqua industry. As an example indicating the nature of BSP in simple terms, the deep ocean water (DOW) which wells up in large amounts offshore from Peru and Chile will be separated into concentrated DOW and fresh water (used for applications such as agriculture) by using temperature difference desalination technology (employing solar heat and the low temperature of DOW). Ponds will be created on desert shores, filled with concentrated DOW (seawater containing fertilizer), and will be used to culture halophilic microalgae. A variety of organic substances will be extracted from microalgae, and a biomass industrial complex will be created by consolidating and linking the above industries using these organic substances as raw materials. The key point is that the energy required by BSP will be entirely supplied by renewable energy (first candidate: solar heat). Carbon dioxide balance will be maintained and strong competitiveness also achieved in each industry by using renewable energy and low-cost raw materials. Photo 1: In a desert area located on the west coast of Australia. The lake looks pink because of Dunaliella. 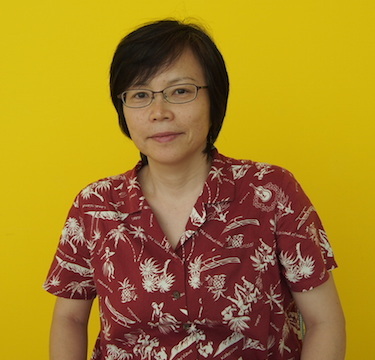 Credit: Midori Kurahashi. Photo 3: Coastal deserts are rich source of renewable energy. Biomass complexies will replace petrochemical complexes to meet the challenge of creating a sustainable society. Collage by the author.